On Tuesday, Sept. 16 at 7:30 pm, the Philadelphia Union will host three-time cup champion Seattle Sounders in the 2014 US Open Cup final at PPL Park (the history of the Philly and the US Open Cup Final, and our look at the Philadelphia German Americans 1936 US Open Cup championship. The U.S. Open Cup final that will be played in Chester on Sept. 16 might be a very good game. A few years ago, we saw one major soccer final after another prove a case of disappointing gridlock, but more recently, that trend seems to have reversed itself. Here’s hoping that the game in Chester between the Philadelphia Union and the Seattle Sounders will be more like the 2014 World Cup final than like the 2010 edition. Even if it is, however, it is unlikely to be the most exciting Open Cup final ever played in the Philadelphia area. The 1960 game is too high a hurdle. 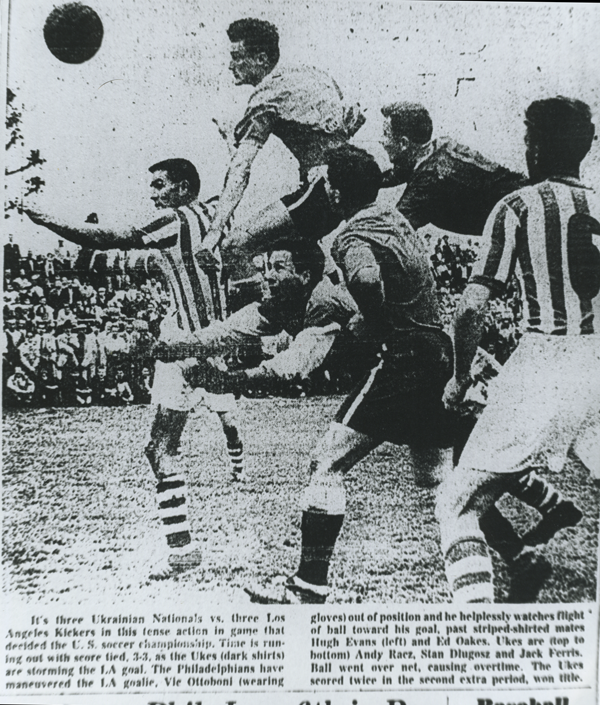 On May 29, 1960 in North Philadelphia, the Philadelphia Ukrainian Nationals beat the Los Angeles Kickers, 5-3, in double overtime. It was a wild ride, one in which the winning team had to come from behind three times. The 1960 Ukrainian Nationals. Image courtesy of Steve Holroyd. 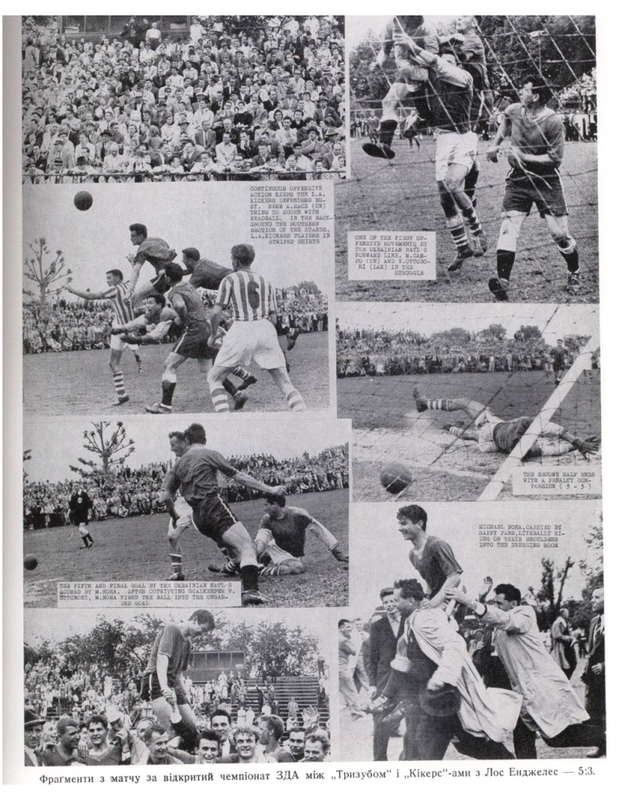 The U.S. Open Cup was a bigger deal in 1960 than it is today, at least within the admittedly small community of American soccer fandom. Today, one of its main attractions is the opportunity for games between teams from different levels of the sport in the United States. Fifty years ago, there also was the fact that because there was no nationwide league, the U.S. Open Cup was virtually the only opportunity for the top teams from different parts of the country to test themselves against each other (the American Soccer League in which the Uke Nats played was limited to the northeastern states). The U.S. Open Cup often was referred to simply as the national championship. The two opponents were probably the two best teams in American soccer at the time. Between them, they were to win the U.S. Open Cup six times. Each had an outstanding individual. Alex Ely of Philadelphia and Al Zerhusen of Los Angeles were among the leading stars of the U.S. national team. Neither of those two proved to be the star of this game, however. Both were eclipsed by Mike Noha, who scored all five of the Uke Nats’ goals. The game was played at Edison Field, which was more often referred to in those days as 29th & Cambria or 29th & Clearfield after nearby street corners. That small stadium just south of Allegheny Avenue has been the home field for several significant Philadelphia teams over the years. Despite an overcast day, there were 5,500 spectators for what was the first of five appearances in the U.S. Open Cup final that the Ukrainian Nationals were eventually to make. Not all of the stars were on the field that day. Serving as an advisor to the home team was Jimmy Mills, who had coached Philadelphia teams to the American Soccer League championship six times. The two rivals had gotten to the final by knocking off some big names in the semifinals earlier that spring. In the eastern semifinal, Ukrainian Nationals had beaten Fall River SC, 3-1 over two legs. In the western semifinal, Los Angeles Kickers had edged Kutis of St. Louis, 3-2. The Uke Nats’ route through the earlier rounds had included victories over the Newark Portuguese, the Cleveland Hungarians, and Baltimore Pompei, one of their ASL rivals, which had been a U.S. Open Cup finalist two years before. Zerhusen started the scoring 15 minutes into the game, putting the Los Angeles team in front with a header. Noha, who played inside right for the Ukrainian Nationals and had emigrated from Argentina the year before though he was of Ukrainian descent, evened the score five minutes later, dribbling past four defenders and scoring from eight yards out. Before halftime, Werner Staacke had made it 2-1 for the Kickers when he scored on a penalty and Noha had equalized again, taking advantage after Los Angeles goalkeeper Victor Ottoboni fumbled the ball. Fifteen minutes into the second half, a shot from outside the penalty area by Eberhardt Herz gave Los Angeles a 3-2 lead, but a penalty by Noha after a handball in the area tied the score once again in the 78th minute. In the final minute of regulation time, a Philadelphia goal by Mike Campo was called back for offside. Shortly before that, the Uke Nats had almost scored with Ottoboni out of position and the goal wide open, but a header by Andy Racz, the captain of the Philadelphia team, went over the bar. After 40 minutes of overtime, the first overtime period plus 10 minutes of the second, Noha finally put the Philadelphia team in front for the first time, taking a pass from Ely and shooting home from the edge of the penalty area. Six minutes later, he got the insurance goal. The same two teams met in the cup final again four years later, and again it was a marathon affair. Even longer, actually. The final was tied, 2-2, after 90 minutes of regulation and 90 minutes of overtime. Los Angeles won the replay, 2-0. The 1960 game was the beginning of a dynasty. 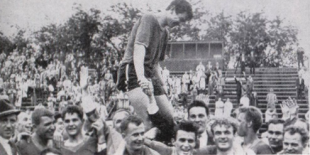 Not only did the Ukrainian Nationals win the U.S. Open Cup three more times, in 1961, 1963 and 1966, they also took the American Soccer League title in 1961, 1962, 1963, 1964 and 1970. The Uke Nats’ days of winning national championships may be long ago, but they are still playing soccer. Like so many teams in American soccer decades ago, they were sponsored by an ethnic social club, and that club still exists. In 1960, its headquarters were on North Broad Street, near the Logan subway stop, but it now is located on a 38-acre property in Horsham, where it has six soccer fields for its various amateur teams. The Ukrainian Nationals’ big star in the 1960 final carried what may sound like a distinctly non-Ukrainian name, an assumption that is even easier to make because Noha came to the US via Argentina. But Mykhajlo (Michael) Noha’s last name actually — and somewhat fittingly — means “leg” in Ukrainian. Nevertheless, there was plenty of crossover of that sort during the era when American soccer was dominated by ethnically-based teams. Perhaps the most famous name demonstrating that crossover was a Philadelphian, Hall of Famer Francis (Hun) Ryan of the Philadelphia German-Americans, who played for the United States in the 1934 World Cup and the 1936 Olympics. There were plenty of others like him, such as John Wojciechowicz of the Kearny Scots-Americans, Ed Murphy of Chicago Slovak, Efraim Chachurian of New York Swiss, and Jorge Benitez of Los Angeles Yugoslavs. Mike Noha is not a well-remembered name in Philadelphia soccer history. But for one day at least, he ranked in the same sort of galaxy as bigger stars like Walter Bahr and Walt Chyzowych. Perhaps Sebastien Le Toux or someone else will make some similar history on Sept. 16. Photo gallery of Ukrainian Nationals 1960 US Open Cup win. Image courtesy of www.tryzub.org. Click here to read a report on the Ukrainian Nationals win from the June 4, 1960 edition of the Ukrainian Weekly. Agreed and the guy heading the ball should have been a high jumper. Thank you for writing this up. LA Kickers are still around but under the name of LA Soccer Club. Albert Z was the sports director up until a few years ago. Unfortunately he passed away at the end of January 2018. This article gives me a better understanding of the amazing “hidden” soccer history here in the US. Albert Z often shared similar stories with us players at the LASC clubhouse after games and practices. He was an awesome guy and will be missed terribly. Thanks again for this amazing article and congratulations to the Ukrainian Nationals for winning the US open cup over my LASC/Kickers in 1960.